According to the Marathon Swimmers Federation, the minimum distance to qualify a swim as a “marathon swim” is 10 kilometers. By that definition, I guess I’m now a marathon swimmer. 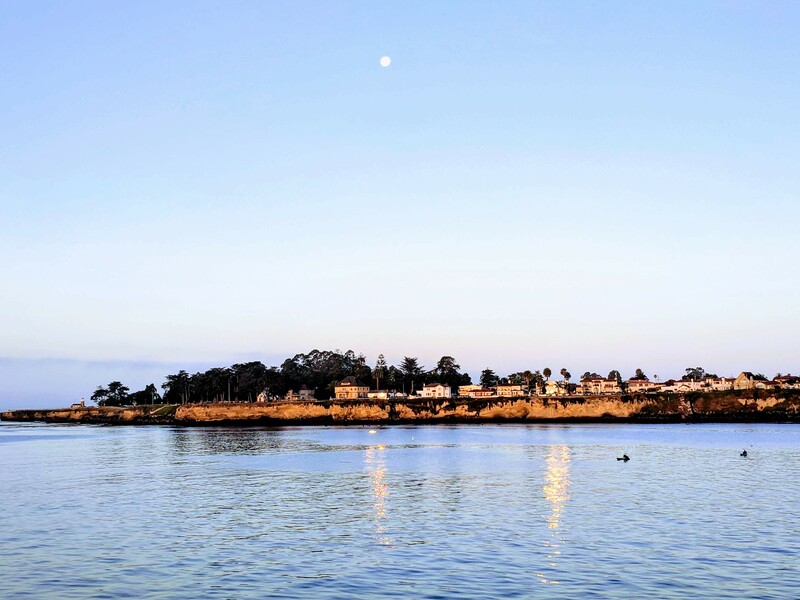 Yesterday I joined about 20 others in a 10km (6.2 mile) swim from the Capitola pier to the Santa Cruz pier, by way of a rather arbitrary point about 2 miles due south from Capitola. The swim was hosted by the Monterey Bay Swimming Association. I got up early in the morning to meet Naji, my kayaker, at the train station at 4:45am, then we drove down to Santa Cruz, arriving about 6am. By 6:30 or so, swimmers were starting to gather as the sun rose. The safety waiver warns about “high, gale force winds; dense fog; great and swift seas,” and many other dangers. Once we had all checked in and signed away our rights in one of the most terrifying safety waivers I’ve ever seen, we piled onto a party bus that drove us east along the winding coastal streets and roads until we reached Capitola. We got out, smeared on sunscreen, and generally got ready to go as the organizer, Scott Tapley, explained to us what would happen. After a bit of prep our kayakers launched themselves into the water just to the right of the Capitola pier, than paddled around to the end of the pier and waited for us there. We swimmers assembled to the left of the pier and waited for the all-clear. At about 8:45am, Scott gave us the signal to go, and the group of us strolled down to the water. (None of the running and sharp elbows you might find in a bigger crowd of swimmers.) A few moments later, we were in the water, swimming out. The course took us straight out to sea, due south from the beach, along the pier and then beyond it. Naji and I quickly found each other near the end of the pier and off we went, continuing south into the Monterey Bay. As we set off on our adventure, the water was smooth, the morning sunny, and the air still. The water, at a comfortable 60 degrees F (about 15 C) maintained its same shade of jade green but became much clearer as I swam beyond the surf break and the end of the pier: I couldn’t see anything below me, but as I looked at my arm in the water, I could see it clear and sharp. At one point I saw a luminous, translucent white moon jelly, about the size of my head or maybe a little smaller, floating alone a foot or two below me. Another time, I stopped briefly to watch a flock of geese or cormorants flying past, heading south parallel to our path, with the sunlit coastline leading up to Pleasure Point in the background. This sunlit outbound leg of the swim was my second-favorite part of the day. Kelp was the biggest potential obstacle throughout this swim, with huge beds of thick bull kelp just offshore through much of the coast. It’s a wonderful thing, kelp, and the return of kelp (thanks to the return of sea otters, who eat the sea urchins that once decimated Monterey’s teeming kelp forests) has been one of the great environmental success stories of the past four or five decades. Kelp forests are richly diverse ecosystems and have helped bring about an explosion of new marine life in the Monterey Bay. But kelp is a pain to swim through and it can be terrifying to dive through, as its swaying tentacles seem designed to entangle the flailing limbs of the hapless human swimmer. Naji did a good job of steering me around the biggest kelp beds, so it wasn’t much of a problem in the end. But occasionally I did have to swim through, and over, a few swaying columns of bull kelp. Their leaves were yellow-green, and many of them bleached or spotted with lighter patches, a sign of sickness or old age maybe. They were a little scratchy but not a big problem, though once I had a nice long loop of free-floating kelp “tubing” looped around my right arm for a few strokes. After heading due south for about an hour and fifteen minutes (roughly two miles), we reached the turn point. The lead sailboat, “Nomad,” had dropped a big, yellow, inflatable tetrahedral buoy at this point, leaving it anchored to the floor of the ocean thirty or forty feet below. I swam to it, came around it, and then Naji put us on our new course: west-northwest, toward the Santa Cruz wharf, which I still couldn’t see. On a swim like this, you feed every half hour or so. Naji would call me over every thirty minutes by waving a sports bottle at me, then he’d toss it to me on a line and I’d drink while floating there. When I was done he could reel the bottle back in on the line, and sometimes I used that time to backstroke gently and pee. (Also essential on a long swim!) I used two kinds of endurance fuels made by a company called Hammer Nutrition: Sustained Energy, which has a sort of sweetish, slightly milky non-taste, and Perpetuem, which is sweetish, more milky, and sort of orange vanilla tasting. Both are powders I mixed with lots of water before the start of the swim, and I tried to drink half a bottle (12 ounces of water and half a packet of powder) at each feeding. Even for liquid food, it’s hard to consume that much while floating on your back or treading water, with a mouth full of saltwater taste, breathing hard from your exertion, and knowing that you’re going to go right back to exerting yourself pretty hard. So I have a lot more respect now for the skills of channel swimmers who have to work out how to feed regularly, and fast, on their long crossings. Anyway, they’re not delicious, but these feeds are essential, and yesterday they worked as advertised, giving me a pretty continuous feeling of energy and power throughout the day. Shortly after that turn, I realized I could no longer see the coastline to my right. Fog had come up, and while it was a light mist, it reduced visibility to maybe a quarter mile to half a mile, and filmed the sun with a greyish hue. Naji couldn’t see the next waypoint, but he could follow the kayakers and swimmers ahead of us, so he kept us on course by following them. I think we may have swum for an hour or so during which I couldn’t see land or anything else except the occasional fishing boat, and in one case a fairly large group of recreational fishing boats off to our left. Meanwhile the sun got fainter, the air cooler, a slight breeze picked up, and the water got a little lumpier. On the outbound leg we’d had nice, soft rollers at most; here the waves were coming at me from my left front quarter and they were a little choppier. I took a fair amount of water up my nose and in my mouth, even choking a bit once. Naji asked me if I was okay, or if I felt like quitting, and he says that when I snapped back at him, “I’m not quitting!” he knew I was all right. He also claims that was the only time I seemed irritated at all, so maybe I’m just good at hiding things. The entire middle stretch, maybe two hours long, felt rough, difficult, and slow. One thing made this leg easier, and that was the presence of another swimmer, Jennifer from Santa Cruz, who I’d met on the beach before. It turned out we were almost exactly the same pace, and once our kayakers figured this out, they let us swim side by side, with the two kayaks on either side of both of us. For an hour or more Jennifer and I swam three to twenty feet apart, always in sight of each other. This helped keep me going, because I saw how strong she was swimming and I figured I wasn’t about to slow down if she wasn’t. And she told me on the beach afterward that I’d had the same effect on her. So without exchanging a word we were communicating and urging one another on, which was pretty powerful. Eventually we came within sight of the Santa Cruz pier and the big hotel behind it, so I could sight on that — and after awhile, the big yellow tetrahedron that had been placed off the end of the pier was also visible, so I could aim for that. It took me awhile to realize that the long horizontal black mark just below the hills was the pier, though. The Santa Cruz pier is huge, about half a mile long, and here’s the thing about huge things: You can see them from a long way off. And then, as you approach them, they can seem exactly the same distance away for a very long time. Eventually, even when you get close enough to see individual pilings and to realize that yes, it is a pier and not some long horizontal band of black rock, even then it can take a long time to get to the end of the damn thing and to the point where you can start swimming in to shore along it. Fortunately, after about six years, that moment came. And then, there we were, swimming up the pier from the end, careful to stay far enough at that we didn’t irritate any of the sea lions we could hear barking under the pier. Naji had to peel off to go land the kayak some distance away, where the surf was lower, so I swam this last half mile — roughly 20 minutes — mostly alone, though there were two other kayakers keeping an eye out for me a bit. Swimming along a pier is something I enjoy immensely, and that’s what made this my favorite part of the swim. It is easy to see that you’re making progress, because you can mark the distance between each breath (or even each stroke) by watching the pilings go by. And in this case, the Santa Cruz boardwalk was visible behind the pier, a series of square, pastel-hued postcards framed by the massive dark-brown and black bulk of the pilings and the green of the water below. It was like watching a slide show go by, making it one of my favorite kinds of swimming: One in which you are making palpable and visible progress, and you get to watch a show as you go. Eventually I was swimming into the surf, then stumbling a bit and finally walking up out of the water. There was a small crew of waiting MBSA volunteers holding towels and cheering for me, and one of them drew a line in the dry part of the sand and told me I had to cross it. I hopped over it with both feet, she wrapped me in a white towel, and my swim was over. The view from the wharf at the beginning of the day: Sunrise behind me, full moon setting in front of me. I wouldn’t see this again until about 1pm. My time was nothing to brag about, but I will brag about it anyway. I came in after 4 hours, 27 minutes, and 17 seconds — about 43 minutes per mile according to the official course. (This is very slow compared to the speedy marathon swimmers, who can do two or even three miles per hour.) The organizer, Scott, told me that the fog and northwest breeze pushed a lot of people off course, so most swimmers did between 6.5 and 7 miles, instead of the official 6.2. That means we had both a longer course and were fighting current and/or wind much of the way, which explains — to my satisfaction anyway — why I swam consistently hard but still came in slower than I expected. The fastest on the course were much faster, and there were a few who endured the swim for much longer than I did, but all the same, I did my best and I enjoyed the hell out of it and I’m glad I did it. I drank two and a half 24-ounce bottles of the Hammer fuels/water mixes, leaving 1.5 bottle un-drunk. Maybe I should have drunk a bit more. I’m not sure which fuel worked better for me but the Perpetuem seemed easier to drink — at least it had a taste. I used SolRx sunscreen, and on top of that I put a layer of extra-strength Desitin (zinc oxide) on my face and arms, and didn’t get too burned. Afterwards I warmed up with a thermos of tea, some cookies, and a banana, and then proceeded to eat a leftover bagel, a 7-11 hot dog, an ice cream sundae, and pretty much anything else that came into my field of vision and sat still long enough. As I seem to do after long swims, I felt immensely happy and giddy — “fizzy” I would say — for most of the day. Eventually that faded, as the evening wore on, into a sort of mellow, relaxed, almost high feeling.My throat felt scratchy and swollen most of the afternoon, because of the saltwater that had been forced into my face for hours. Today I’m sleepy, a little sore, and weak as a kitten, but none the worse for wear. One final note: There is a myth that distance swimming is a solo sport. Yet I don’t know anyone who does epic marathon swims all by themselves. (Well, I know two guys who are epic marathoners and regularly do 10K or 12K training swims in the Bay by themselves, but apart from them nobody does this solo.) For most of us, maybe all of us, swims like this are impossible without a huge amount of support: Swim organizers, boat captains, kayakers accompanying us and feeding us, and our families making time and making allowances so we can sink hours of every week into our training. I felt all of that support yesterday. As I swam, I was physically supported by the water buoying me up, and spiritually supported by the love of all the people helping me swim and keeping me safe. That, perhaps, is the most powerful thing I took from the swim. There is support all around, and for that, I’m immensely grateful.